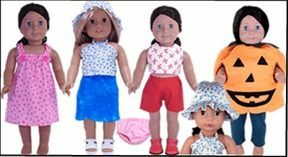 Rosie's Doll Clothes Patterns is an online sewing heaven for young girls. 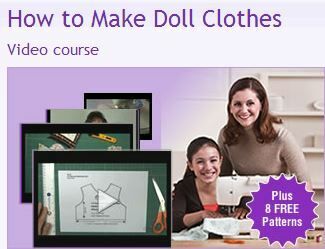 Learn How to Make Doll Clothes Video Course with 8 Free Doll Clothes Patterns includes 130 video tutorials and 8 free pdf patterns for 18 inch doll clothes. If you prefer Cabbage Patch Kid sized patterns Rosie can arrange to get those to you. Each pdf pattern comes with step by step instructional videos which really helps the beginner sewer learn to how to not only follow a pattern, but to go slowly through each individual step. You get the complete video collection, pdf patterns, and instructional videos for $47.85. You will have access to the online video's for 12 months. This program is geared for ages 8 and up. I have been telling my 9 year old for awhile now that I want her to learn to sew, but I was at a quandry as to how to go about teaching her. I have sewn for probably 20 years now, though I do prefer quilting and making blankets. I knew I needed to start her out in the beginning but I haven't ever taught anyone to sew. Rosie's program is a huge blessing! The video's start out very basic, in the beginning with the tools of the trade. Shiloh sat and watched the video's while I was in and out of the room. Some she knew about already from watching me sew, but some had some new tools that I wasn't aware of like the looper to thread elastic through. Each video is short, which allows you to sneak them in when you can, or to watch several at one time. Rosie does have an accent which makes a few things different when listening. She does speak clearly and there was only a couple of times we had to rewind to see what she said. Shiloh watched through several weeks of videos. Each topic has several videos within its category as well. We were ready to get started, and she was so excited to get her 'sewing area' set up. It has honestly been close to 2 years since I pulled out my machine and it was a blessing for me to see her excitement. The patterns were easy to understand and to work with. I put Shiloh to work cutting it out herself and working on lining up the pieces for sewing. She worked the peddle while I worked the machine. My Brother sewing machine wasn't cooperating or she would have been able to do all the work herself. My Kenmore doesn't have a speed control on it and that was making Shiloh nervous. One step at a time. It took no time at all to get the shorts made. I did watch the instructional video with Shiloh and it helped refresh my memory on making clothing. That has been a long while for me. This is so much more than just a learn to sew program. It is a hobby that my only daughter and I can share together. Rosie can do the teaching while I get to enjoy the doing. It is a perfect combination for us, and a blessing to spend the time working with Shiloh. My 11 year old son loves to sew and he had to get in there while the sewing machine wasn't being used, to make a blanket for his stuffed bear. Sewing is definitely not just a girl hobby either. We will continue to make the patterns that Rosie has given us and look forward to watching Shiloh grow in her skills. I am so thankful she is still a young age to enjoy playing with dolls and making fun clothes for them. 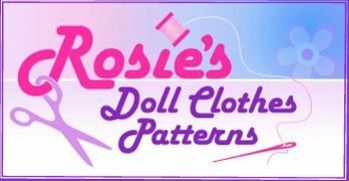 Rosie has additional patterns for sale which include the pdf file, instructions and video access. Check out the other patterns my Crew Mates used in their reviews by clicking on the banner below. Tell your kids they are very creative and I loves seeing their creations. Keep on sewing! I think it is wonderful for children to learn how to sew. This is a great idea to start making doll clothes, they are so expensive to buy. How proud they must feel with the finished project.